“Humor Abuse”, a solo performance play by Lorenzo Pisoni and Erica Schmidt, produced by A.C.T. in association with the Seattle Repertory Theatre. Director: Erica Schmit. Lighting: Ben Stanton. Sound: Bart Fasbender. Don’t worry. He’s plenty funny alright, and the sweat is well-earned as he demonstrates a seemingly endless array of dazzingly athletic circus clowning tricks while telling the tale of his show biz childhood growing up as part of The Pickle Family Circus. While not literally born in a trunk, he spent endless hours hidden in his father’s prop trunk to emerge to laughter during performances. He describes being crammed in the trunk with his sister, in scorching heat, surrounded by helium balloons which would often pop. Loudly. He was three years old. The story is shocking as well as funny. The life Lorenzo describes is all at once wonderful and frightening, joyful and abusive. 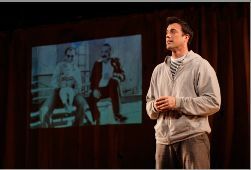 He and co-writer/director Erica Schmidt have fashioned a truly complex and moving play about a father and son, not merely an assemblage of circus gags. But there is no shortage of gags, brilliantly performed, and funny enough to make you cry, which is the essence of great clowning. Lorenzo Pisoni performs his one-man show about growing up as the youngest member of the Pickle Family Circus. Historic photo featured on set by Terry Lorant. Production photo by Chris Bennion. Pisoni and Schmidt have seamlessly welded the clowning and the personal story so that they cannot be separated. Even as Pisoni demonstrates a routine that involves multiple tumbles down a staircase, we never forget the distinct individual who has befriended us and never fails to both entertain and teach. It is a dual vision, just about perfect in execution. Even while making us laugh, Pisoni communicates his father’s teaching that clowning is a sacred business. His childhood birthday gifts consisted of masks and various shamanic tools, simultaneously beautiful and puzzling. His anecdotes about his father capture a touching ambivalence. At one point, he describes how his father approached him when he was an adult and invited him to team up for an act: “I’d like you to join me in my one man show.” Think about it. That’s some awfully good writing, right there. All of the clown routines, like the songs in a well-realized musical, move the story along and never occur in a vacuum. But they stand by themselves as well, so there is no shortage of fun. Children will love this production. When Mr. Pisoni demonstrates the original clown act he created after his father left the circus, involving flippers and a ladder and a daring dive, he achieves a balance of pathos and slapstick that is the heart of great clowning. Think Chaplin. Think Gleason. Think, for that matter, of Lorenzo Pickle (Larry Pisoni, Lorenzo’s father—yes, that’s right: Lorenzo was named after the clown character). This is one of those shows that you will remember for a lifetime. They don’t come along very often. You should attend, and bring the whole family. Humor Abuse continues at A.C.T. through February 5. Special family discounts are available. For further information, click here.